During the final stages of a domestic flight, a Garuda Boeing 737-300 entered heavy cumulonimbus cloud. In severe turbulence with heavy rain and hail, both engines flamed out. Eventually breaking out of cloud, the crew sighted a major river, and the captain decided to ditch the aircraft. 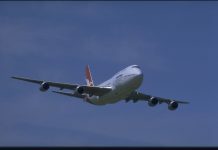 All but one of the 60 occupants left the aircraft before it settled in shallow water. The body of a flight attendant was later found in the river. 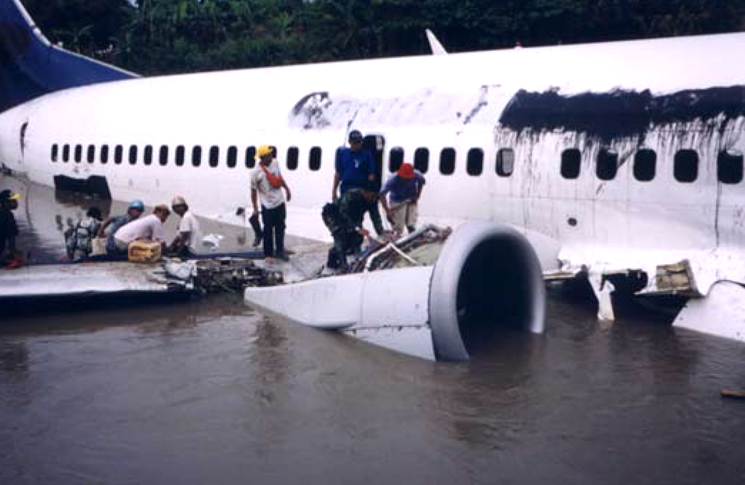 A Garuda Boeing 737-300 was making a scheduled flight from Ampenan on the island of Lombok, to Yogyakarta, Java, 340 nautical miles to the west, with 54 passengers and a crew of six, on 16 January 2002. The aircraft took off from Ampenan at 16:30 local time in fine weather and the flight was uneventful at flight level 310 until approaching the Yogyakarta area. At 17:08, Bali ATC instructed the aircraft to descend to FL280 because of eastbound traffic. Five minutes later, the crew requested further descent to FL190 in preparation for their approach to Yogyakarta, and were cleared to do so. As the crew began the descent, the aircraft’s weather radar was painting a line of cumulonimbus cloud across the aircraft’s track. The radar screen displayed red cells directly ahead, indicating intense precipitation, with two green and yellow areas of lesser intensity to the left and right. The captain decided to divert to the left to avoid the severe weather: there was clearer weather further to the left, and mountains lay to the right. The crew prepared to enter the turbulence by reducing speed to 280 knots, switching the engine ignitions to FLT, selecting the anti-ice system on and turning on the cabin seatbelt signs. But after reaching the apparent gap in the line of weather, their radar display turned to solid red. Shortly afterwards the Boeing ran into severe turbulence, with extremely heavy rain and hail. A minute and a half later, both engines flamed out. When the crew’s two desperate attempts to relight the engines failed, they tried to start the APU, again without success. The aircraft had lost all electrical power. ATC was expecting the Boeing to report again at 17:22, and when it failed to do so called it twice, without response. Yogyakarta Approach Control was then asked to check the aircraft’s target on their radar screens. It was still showing at FL200, descending. Then the flight path was seen to become unstable in direction and speed, finally fading from the screen altogether at 17:33. ATC asked another aircraft operating in the region to hold in the area above where the Boeing’s target had vanished. Meanwhile, descending in cloud without power, the crew were maintaining control on stand-by instruments alone. The aircraft eventually broke out of the base of the cloud at about 8000 feet. Without electrical back-up power to operate the hydraulic system and flaps, the crew were now committed to a forced landing at 180 knots. With the aircraft losing height at 1500 feet a minute, there was little time to prepare for a crash landing. In sight, not far away, was the Bengawan Solo River, a major waterway. The crew decided a ditching, with flaps and undercarriage retracted, was their safest option. The crew instructed the flight attendants to prepare the cabin for the emergency, and at 17:24 the aircraft ditched upstream in the 75-metre wide river between two bridges about two km apart. The river depth at this point varied between one and five metres, and the underside of the fast-moving aircraft struck rocks, badly damaging the rear fuselage and throwing one of the flight attendants in the aft jump seats into the water. The flight attendant seated beside her suffered serious injuries. Twelve passengers suffered minor injuries, but the flight crew and other two flight attendants in the forward jump seats were uninjured. After the aircraft came to a stop, the flight crew had to kick open the door to the cabin to help flight attendants evacuate the passengers. Using his mobile, the captain reported to the Garuda Operations Centre in Jakarta they had ditched. The only exit immediately available was the forward service door. One of the flight attendants assisted five of the six business class passengers to evacuate through this door. An economy class passenger opened a starboard side over-wing exit and was helped out by a local fisherman. Other passengers in economy left the aircraft through this over-wing exit, some first trying to retrieve personal belongings from the overhead bins, despite the flight attendants’ shouted instructions to leave their luggage. The aft doors could not be used because of structural deformation of the rear fuselage and the fact that floor sections adjacent to the doors had collapsed. Villagers and a rescue team helped with the evacuation and about an hour after the ditching, all the passengers had been moved to safety. 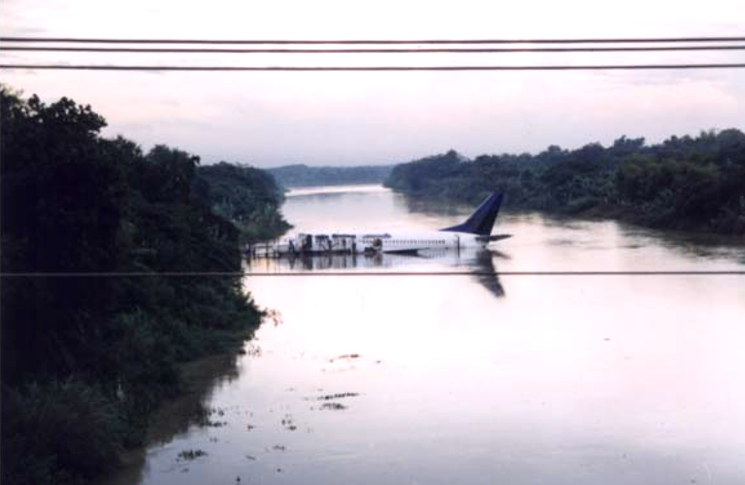 The aircraft ditched in the river in a nose-up attitude, with the nose to the right of the landing path. The airframe sustained heavy damage aft of the starboard side cargo door, and between the cockpit and front wing spar bulkheads. The fuselage skin was buckled immediately in front of the fin. The torn-off nose leg and starboard main landing leg were found in the river 50 metres from where the aircraft came to a stop. One of the aft toilets and the lower part of the aft galley were torn from the cabin, leaving a large hole in the floor. All the detached components were found in the river downstream. In the cabin, seats were torn from their fittings. The floor aft of the cockpit door was buckled, the business class cabin floor had collapsed, and overhead luggage bins were dislodged. No hail damage was found on the airframe, except on the radome, which was heavily eroded, but also appeared to have areas of previous damage and repair. The flaps and slats were retracted. The port engine was still attached to its pylon, while the starboard engine was torn from its pylon. Both engines had sustained impact damage. The APU and battery were found 300 metres downstream from the wreckage four weeks after the ditching. The impact damaged the side of the flight data recorder casing, making it difficult to open and causing some internal buckling. The crash-protected module was refitted into a serviceable unit and successfully replayed. The cockpit voice recorder, although sustaining some external damage, was also successfully read out. The read-outs showed the aircraft was in severe turbulence and exceedingly heavy rain for a minute and a half before the recording stopped. No abnormalities were found that could have contributed to their flame-out, or their inability to relight, and all water and hail-protection modifications were in place. Testing of the battery and its related components showed that the battery voltage failed as soon as an engine starting sequence was begun. Five seconds after the starting sequence commenced, it had depleted to only 12 volts. It was concluded that an engine starting sequence could not be completed if the voltage was less than 22V. Examination of the battery showed that cell No.12 had very little electrolyte in it. 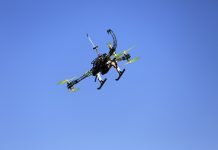 The battery has been installed in the aircraft for 204 flying hours. Before this, it had been stored at Yogyakarta for four months, where it had been charged four times. A weather satellite image, taken 14 minutes before the accident, indicated a super cell of cumulonimbus cloud that could have topped out as high as 63,000 ft. It was likely that the weather radar signals were attenuated because the rain was so heavy that radar waves could not penetrate it. The radar screen thus displayed false ‘gaps’ which, after the aircraft entered the precipitation, became red. It was doubtful that the crew could have identified such attenuation, but if they had adjusted the radar tilt to sweep the ground during their descent, they could probably have identified the severity of the weather on their flight path. The fact that both engines flamed out at the same time supported the view that it was not related to any maintenance problem. Relight attempts failed because the aircraft was still encountering precipitation beyond the engines’ certified capabilities. An engine manufacturer’s representative said that once a flame-out occurred, it would be very hard to relight the engines while the aircraft was still in adverse weather. The flight crew’s reported actions to restart the engines and APU, however, were contrary to the procedures in the Boeing 737 operations manual. They waited only about one minute between each restart attempt instead of three minutes. Whether this was significant, in view of the extraordinary rainfall and the aircraft’s other problems, is hard to say. One of the battery cells had very little electrolyte. This caused a high resistance, resulting in the battery voltage dropping rapidly and the battery failing. The loss of battery electrolyte was caused by overcharging and high temperature (there was no high temperature sensor on the battery because the mounting was corroded). Trickle charging during storage makes a battery consume water, so it is important to ensure that cell water levels always meet specification. a complete loss of electrical power during the second relight attempt. So-called ‘third world’ airlines are often criticised for lack of standards and poor flying skills. But in this case the conduct of the Indonesian pilots was exemplary. They carried out a skilled and successful forced landing in the most challenging of situations. It is unfortunate that the section of the river in which they ditched was shallow enough for the underside of the aircraft to hit rocks. The outcome of the double engine flame-out might otherwise have been ranked with that of US Airways Flight 1549, the Airbus A320 flown by Chesley Sullenberger and Jeffrey Skiles, which ditched in the Hudson River, New York, after a loss of power on both engines, with no deaths.